We offer lots for the family – sandy beach for swimming or sunbathing, paddle boats, hiking trails, playground for the kids, diving deck, boats and motors. Enjoy the Temagami forest area, a wonderland of lakes, islands, majestic pines, shining birch, hard maple, and fantastic sunsets. Eight completely equipped clean two & three bedroom cottages. Fridges, stoves, cooking utensils, electricity, pots, pans, dishes, wood stoves, central showers, linen are all supplied. Cabins available all facing beautiful Wilson Lake and a magnificent sunset. Excellent moose hunting. Some of the most successful areas with tag available. Combine hunting and photography as the leaves are changing to spectacular colors. 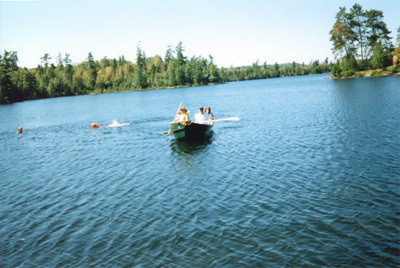 Fish for Pickerel, Pike, Bass on our lake, or try one of our four outpost lakes for Pickerel, and Pike, all a short portage or drive from our camp. Live bait available. 3 km on Wilson Lake Road , off Hwy 11 North. 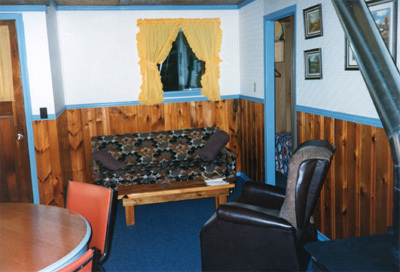 See what's available on the Wilson Lake Cottages Availability Chart.